Being pregnant has found me searching Pinterest....a lot. And I have been finding quite a few great recipes on there. Generally I am used to cooking and experimenting and bringing my readers my own recipes, but I have found that since I got pregnant, my attention has been severely diverted. I've been busy nesting, of course, and building the nursery, and beyond that, I have found there are a thousand things to do when you are expecting. Yet I still loooove to cook, and I am always trying new things. But they aren't always making it on the blog. Sometimes they do, but not all the time. That, and I noticed that all my recipes lately have been desserts. Funny how my pregnancy sweet tooth has crept into my blog, isn't it? To remedy this issue, I thought I would put together a nice little list with short critiques of my cooking endeavors from Pinterest. Because there are a TON of great recipes out there, and they should be shared, am I right?! I made this cake and I thought it was AMAZING! I followed the recipe above and got lots of compliments at my sister-in-law's going away dinner. Everyone thought it mimicked cheesecake. One of my readers tried it and said although it was tasty, hers did not come out as smoothly as mine did. But as a dessert, I really feel this is a unique and awesome way to impress people! One day I was searching Pinterest for "ground beef" recipes and I stumbled across this gem. I made it for a potluck dinner I had with my family and boy was it a hit!! I changed a few things up, of course, because that is how I roll. Mostly adding a little garlic, some worcestershire, and extra spice. This recipe leaves some wiggle for that sort of thing, and reading the comments section of the recipe, lots of people had ways they modified it to give you inspiration. But do yourself a favor and make this one--it's awesome! This was a great and super easy recipe! It also reminded me of my grandma's goulash, which is so simple that I should get around to posting that on here one of these days.... One pot meals, for me, are soooo simple and can be a real energy saver. My husband LOVED this recipe and, miracle of miracles, even ate the leftovers! What I really liked about this recipe is that it's so adaptable, and I did, indeed modify it because I was cooking for 2, not 7. 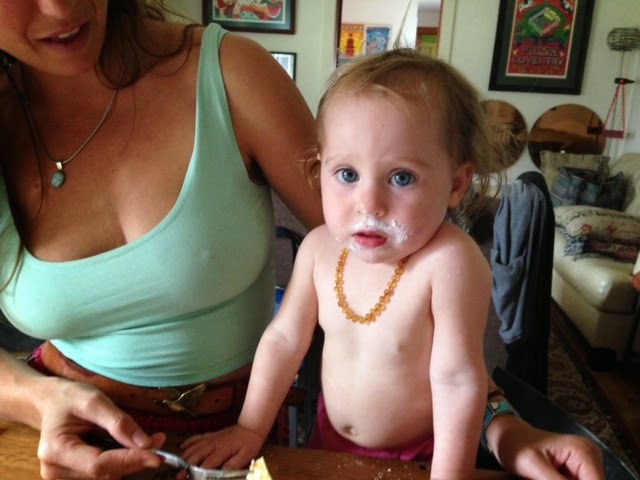 Magic cake is baby approved! I was the most skeptical about this recipe, but it did not disappoint! It's the cake from the picture, and you make a thin batter, bake it in the oven at a low heat and PRESTO, it makes itself into a couple of layers, one of which is very custard-like. I enjoyed it because it wasn't overly sweet or overly cakey. And we found it paired VERY nicely with a little jam and tea! Definitely worth a try if you are into desserts.